Luxury tea, coffee and hot chocolate merchants Whittard of Chelsea are launching a prize draw to win a year’s supply of their most popular blend of Herbal Infusion teas, as voted for by fans. With a choice of 9 different varieties on offer, the poll to discover the most popular Herbal Infusion tea ran on the Whittard Facebook page. Lemon, Ginger & Echinacea proved the voters’ favourite Herbal Infusion blend, with 22% of votes, closely followed by Strawberry & Vanilla Rooibos with 20%. All of Whittard’s Herbal Infusion range combine only natural ingredients, are caffeine-free, and contain no added sugar or artificial sweeteners. 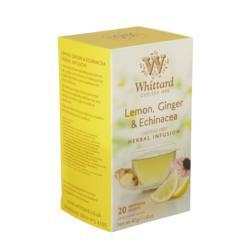 The vote has now been replaced by a prize draw to win a year’s supply of Lemon, Ginger & Echinacea Herbal Infusion. The draw will end at midnight on Wednesday 6th February. Whittard of Chelsea sources the finest teas and coffees from around the world and with 125 years of experience, our people are specialists and proud of the products we deliver. We offer a wide range of teas, coffees, hot chocolates, instant teas and tea gifts, as well as crockery and equipment. Our mission is to surprise and delight our customers with our passion for the very best tea, coffee and related gifts.